When I got pregnant with Sebastian far sooner than expected (only crazy people deliberately have babies 15 months apart) it mucked up my big baby game plan. The original plan was to have the kids 2 to 2.5 years apart. Prams, high chairs, cots etc would all be passed down to the new baby with no need for new purchases. All that went out the window since Hubby and I have clearly neither learnt to count, restrain ourselves, or use protection. When I realised that both Lorelei and Sebastian would need cots at the same time (although actually, since we kept Seb in his crib far longer than we should have, this might have been avoided anyway), I set out looking at used cots on eBay. Eventually I found a gorgeous cot, along with a portacot, girls bedding set, matching bumper & valance, big bag full of various sheets and other linen, and a bouncer for $120. We snapped it up and had it all home before the women selling it could blink. We didn't need or want any of the other items, with the exception of the portacot. We already had one, but knew a second one would be handy on holidays until Lorelei was old enough to sleep in a bed. So I broke it all down into separate componants. The bedding was washed, ironed, and photographed in a far more attractive light and listed on eBay. It was a popular and expensive set, and it sold for $60. Since it would cost around $120 brand new, I was pretty pleased. The matching bumper and valance sold separately for another $30. The bag of random, cheaper quality linen was listed on a facebook garage sale page, and sold for $10. The bouncer also sold for $5, and the mattress that went with the cot for another $6. Total sale price: $111. We used the money from selling off all the bits and pieces to purchase a new mattress, on sale for $80. So the total end price for a quality used cot and new mattress ended up being $89. Bargain when you consider people pay $500-$1000++ for the same items. It could have ended up costing only $15 if I were willing to use a second hand mattress but I prefer to buy a mattress that is geared towards people with allergies, since Husband is pretty bad. 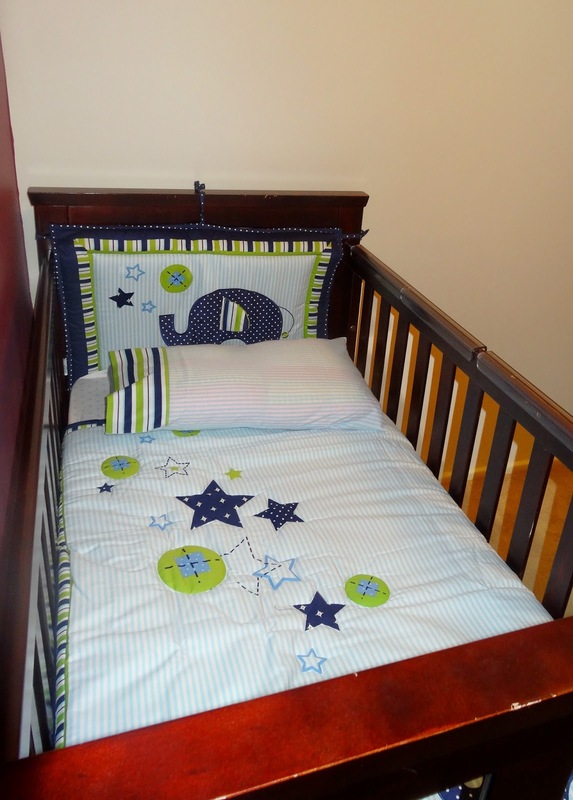 $89 is a huge savings on buying the cot brand new or even buying it second hand on its own. Many of the used cots I looked at would have cost close to how much we paid for this one with all its extra's. Both babies now have cots that convert into toddler beds, so both will be able to use their own cots and linen til they are 4 or 5. This is fabulous, because it means when the time comes to set them up in big beds, I can gear the bedding and bed type towards an older child, and it should all last them through to high school. We found with Madeleine that we replaced all her toddler bedding when she got a little older in primary school, and again now that she is in high school and funnily enough no longer interested in pink fairies. When the time comes, I will keep one cot for the future grandkids to use when they sleep over, and sell the other. We are almost at the point that I can sell the spare portacot, since Lorelei just went into the toddler bed recently. So the total of Sebastians cot costs will reduce again when the portacot is sold. How do you make/save money? Ever tried buying in bulk and selling of the excess? That's an amazing saving, well done! We've managed well with our kids, as they are spaced apart that little bit more, so we were able to move one from toddler bed (converted from cot) to proper bed (with siderail) when the next one was ready for the cot. Now MissyMoo3 will be in the cot/toddler bed for a while! Fantastic! I love to hear eBay stories. We sold on ebay for years when we lived in the USA. I kept most of my 4 boys in their cots until they were 3. What a clever idea! I often look at bulk lots on eBay and wonder about this - especially when people are selling ten or twenty items of clothing all at once. Maybe I'll give it a try. My rule of thumb is that the bulk lot has to be within a reasonable range of the budget I set myself for the item I want. That way I minimise the damage if the extra items don't sell (although that has never happened) Thanks for commenting! baby stuff is so pricey - especially when you need 2 lots at once. Our first purchase was a cot/toddler bed combo and it was great, we got the bigger Boori one, but still there is no chance Miss 4 would be sleeping in it now, four year olds can have very long legs. Hand me downs are the best, I have no issue with them at all! lol Poor sebastian has been known to wear a pink bonds suit when its been raining and the washing falls behind (although these days I try to buy neatral colour things for singlets and onesies so that both babies can wear them). 3 in 3.5 years, oh my you have my admiration! Fantastic savings! I never considered re-selling the unwanted items that often come packaged with my Ebay and Gumtree purchases. We were set to re-use from our first born, until we found out we were having twins. I seriously considered "top and tailing" them in the one cot until I could put them in toddler beds. It hurt my wine fund to have to buy an extra cot! I tried to top and tail the kids in a portacot recently. It didn't work. Neither would sleep and both wanted to play. Good Golly Miss Lolly! She's TWO!